Which OS on Latitude CS? I have a Dell Latitude CS (P-II 400MHz, 192MB RAM, 20GB HD) that I'm playing with. I installed OpenStep 4.2 but the video controller (NeoMagic 2360) isn't supported under OpenStep (neither is the audio controller, also a NeoMagic) and it wouldn't recognize the whole HD (only 8GB). I found some NeoMagic 2097 NextStep drivers here but it doesn't work as is. I also found the source code to the whole NeoMagic driver spectrum on koders.com but browsing through it quickly nothing jumped out. I may try again and go through the code in more detail but I doubt I'd be able to modify the Japanese driver to work with my controller. Also, I probably wont be able to get the audio working. So, which OS instead? Before, let me explain that I'm intending to use this machine for light web-browsing (minor), maybe some email, but mostly writing. I'd like to keep it dual boot into Windows2k for compatibility. BeOS is an option and so is some Linux distro. 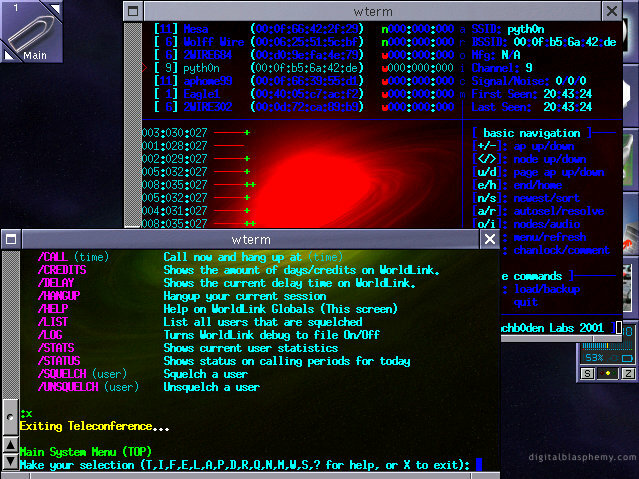 I played with MkLinux few years ago and also Mandrake. What are the preferred distributions today? Ubuntu? For the Linux OS, Ubuntu or Knoppix would be good choices. Both have live CD distributions, so you can try them out before committing to wiping the HDD and installing. Win2k would be a perfect choice for the other OS; just make sure you install SP4 and all the critical updates. I checked the Ubuntu website and the Latitude CS isn't listed there as a compatible model (which doesn't mean that it is incompatible, just seems no one has tried it) so I'm a little bit worried that it might not work. But I'm downloading the ISO so we'll see. Ubuntu has run on nearly everything I've thrown it at, so long as it had enough RAM. If you're over 128MB it'll be ok. 256+ is best. I've run it on 512MB on most of my machines and it's very smooth. For your laptop, I might suggest Xubuntu if the regular Gnome based Ubuntu is too slow + RAM hoggish. Yeah, Xubuntu might be worth it. If I can install WindowMaker as a window manager instead of Xfce then I have "modern" NextStep. I really like the NeXT "look and feel". Time for another iso download. I agree with Xubuntu, I use it on my iBook Clamshell 366, and a *OLD* HP NetServer LC3 with 2x400Mhz CPUs, it flies with Xubuntu. WM is the continued version of GNUStep, which was an OpenStep clone. I've been using WindowMaker for about 8 years now. I personally prefer OpenBSD or FreeBSD for these things, but WindowMaker is just a window manager for X11/XF86/X.Org so it will run on pretty much any UNIX-Like operating system. Packages are available for any distro I've ever tried. You don't really need to grab another ISO. You can install Ubuntu, then use the package manager (Synaptic, or apt-get on the command line) to install xubuntu-desktop. Once that's on you can use the manager to remove ubuntu-desktop if you want the drive space back. If you got the alternate install ISO, you can just do a minimal install and then add in the xubuntu-desktop package.